Who Wants to be a Square Tomato? What do you want to be when you grow up? This is a great question, especially if you are a tomato. I ask my tomatoes this question from the time they are seeds. Even before, when I am preparing the soil for the tiny little seed, I think of this question: what do you want to be? But unfortunately, not all tomatoes think this way. Take the tomatoes you see on the grocery shelf. These tomatoes, raised by agribusiness, have other priorities. 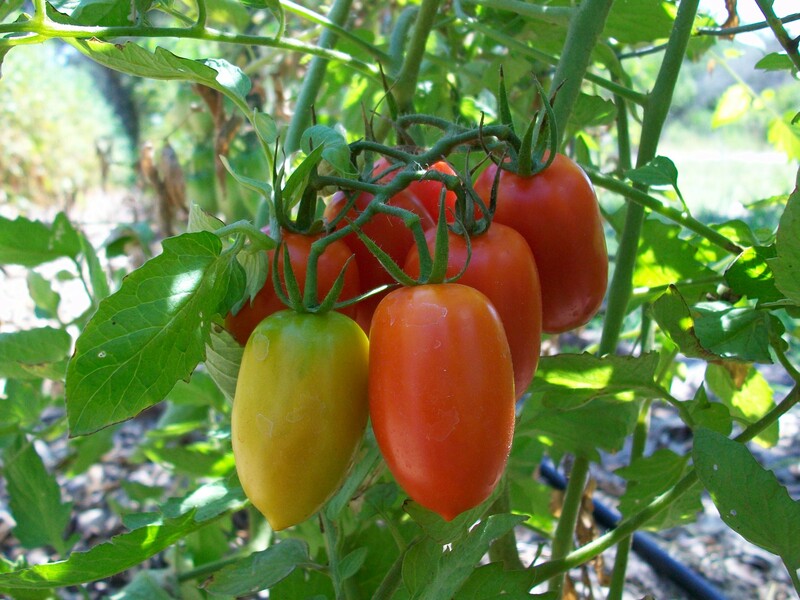 Conventionally grown tomatoes are designed to ripen simultaneously and at the same size, for ease of machine harvesting. They are bred to have a tough skin, to survive rough handling and a long transport. They are engineered to withstand the harsh chemical fertilizers and pesticides applied to them. They are picked early to make the average 1,500 mile trip from Mexico or South America all the way to the grocery shelf in Rockport, TX. And yes, conventional tomatoes are designed to be roughly square-shaped, to fit more tomatoes in the shipping crate! What kind of tomato grows up wanting to be square? Where does “delicious” even rank on the agribusiness list of priorities? Our tomatoes only want to be delicious. They also happen to be very fresh and very healthy, but they can’t help it—nature made them that way. We deliver our farm fresh food to your door in Rockport (minimum $20 order). Or, look for the Four String Farm booth at the Rockport Farmer’s Market. Or come out to the farm and pick the tomatoes yourself. They are red, beautiful, delicious, and round! Mmmmmm … I want some of your tomatoes!! How do I get them?? We deliver in Rockport. Or, come to the Rockport Farmer’s Market or the farm to pick some up!